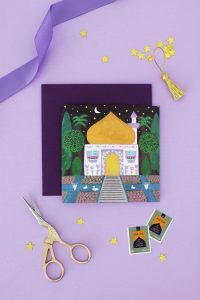 Easy “Eid Mubarak” Garland – Hello Holy Days! 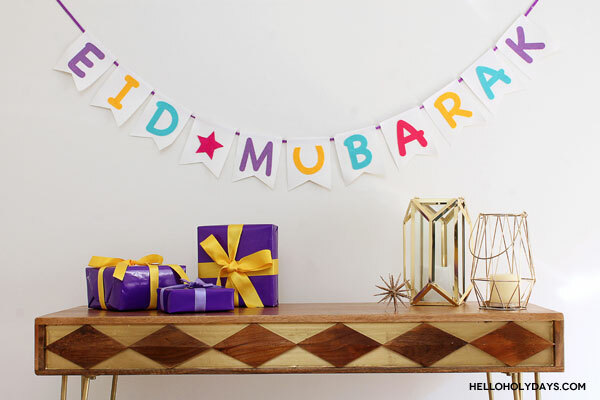 Here is an easy “Eid Mubarak” garland that you can make in under 10 minutes! This post is sponsored by HomeSense and here I’ve made an “Eid Mubarak” garland in Ramadan and Eid al Fitr’s colour scheme and paired it with HomeSense’s console and lanterns. The console is perfect for displaying gifts and with the added garland, it creates a wonderful focal point in the home! See below for how to make this super easy garland. Sort alphabet stickers to spell “Eid Mubarak” in Ramadan/ Eid al Fitr’s colours. Here purple, yellow, blue, pink are used. Remove backing from stickers and adhere one letter per bunting piece. Cut out a star from the felt and hot glue it to a bunting piece. This piece will work as a word break between the words Eid” and “Mubarak”. Using the hot glue gun, attach each bunting piece to purple ribbon. Be sure that when attaching ribbon to the back of the bunting pieces that you spell the garland backwards. So you would arrange the letters “karabum * die”. Once flipped over you will have Eid * Mubarak with the star in between the two words!